After 10 million votes, the results are in. Designer Mark Ecko will brand Barry Bonds’s record-breaking home run ball with an asterisk and the Hall of Fame will accept it — blemishes and all. Let it serve as a reminder that it takes more than a number to earn the respect of your peers. What a *perfect* exhibit for a museum. 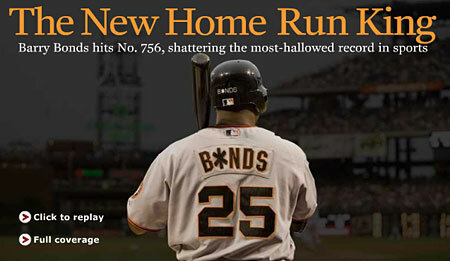 DISCLOSURE: After reading Game of Shadows and numerous reports, I’ve come to the conclusion that a) Barry Bonds is not a cool dude, and b) he knowingly took steroids in an effort to break records despite his being one of the greatest hitters to ever play the game.